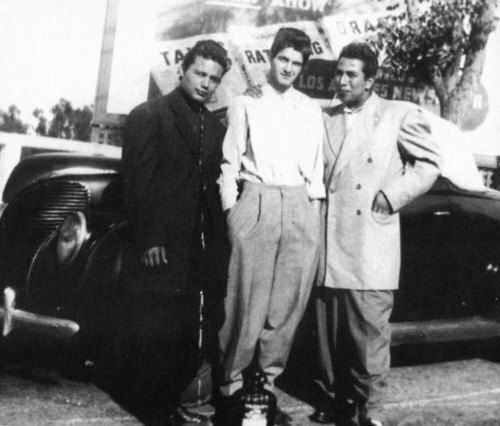 Put this On has a short slideshow and rundown of LA’s Zoot Suit Riots. June of 1943 found literally thousands of servicemen roaming the streets of the barrio, beating any and every young Latino they saw. Mobs went into movie theaters, pulled out Chicanos and beat them. Police intervened – to arrest the Chicanos on charges of vagrancy and delinquency. Eleanor Roosevelt had the temerity to describe the violence as race rioting, and the Los Angeles Times published an editorial accusing her of communist sympathies. But what exactly did ER have to say about it all? On June 16th, 1943, Eleanor Roosevelt commented in her column that, “The question goes deeper than just suits. It is a racial protest. I have been worried for a long time about the Mexican racial situation. It is a problem with roots going a long way back, and we do not always face these problems as we should.” Los Angeles’ response was typified by the June 18th headlines of the Los Angeles Times, “Mrs. Roosevelt Blindly Stirs Race Discord,” and she was accused of communist leanings in the accompanying editorial. Governor Earl Warren (later Chief Justice of the U.S. Supreme Court during their landmark desegregation cases) convened a committee to investigate the riots and recommended punishment for all involved in the riots, servicemen and civilians. Other than the charges filed against the Mexican American victims, no punishment was ever meted out. Via.